Editor’s Note: What follows in an addendum to an the Editorial Page feature Why I Love Where I Live, published in the Tuesday Gazette. 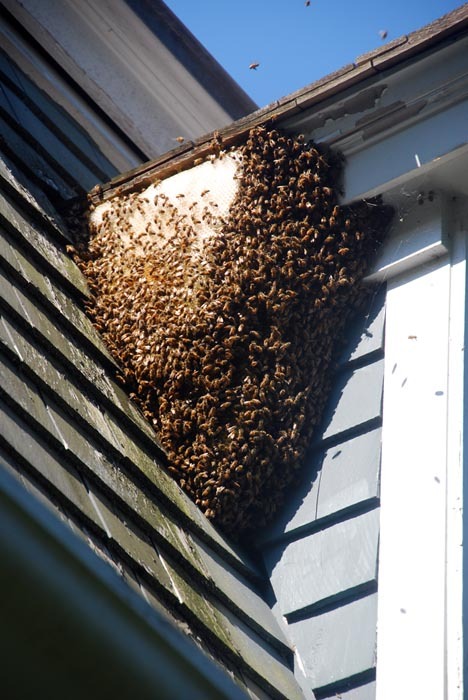 Sunday afternoon we discovered that the honeybees have returned a third time to the same north-facing dormer. Years ago, when bees moved in, we had them relocated by beekeeper Neil Flynn. After dismantling and rebuilding the dormer, he carefully sealed off any points of entry into the roof. Evidently drawn by the residual pheromones from past hives, and thwarted by bee-proof carpentry, this time the bees have opted to create an external hive. Neil tells us that external hives are a rare occurrence, since bees would normally choose a hollow tree or some similarly protected space. Further, he tells us that this is a primary swarm (not a smaller secondary swarm) consisting of at least 35,000 bees and weighing about seven pounds. These bees are welcome to stay as long as they can, although we were saddened to learn that the hive may not make it through the winter and could be tricky to move.